Welcome to our company that has been family owned since 1882. We would like to thank you for viewing our web site, and always value our customers suggestions and comments, so please feel free to contact us at any time. 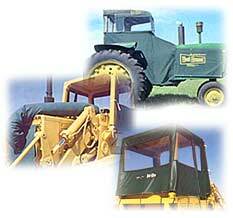 We have been making quality textile products for Agriculture, Industrial and Fire Departments for over 100 years. We also manufacture specialty items and made to order products for customers all over the world. Below are a few examples of our products. Agricultural Weather Protection/ Heat Houser: An accessory for tractors that channels heat from the engine back to the operator. Kolaps-A-Tanks: Portable water tanks that are NSF/ANSI Standard 61 approved for contact with drinking water. 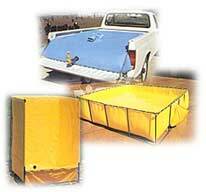 Fire Kolaps-A-Tanks: Collapsible water tanks used in rural areas. Decontamination Booths: DB85 used in hazardous incidents. Vehicle Overload Signs / Safety Flags: Used in the trucking industry. If a product you need can be made of canvas or vinyl coated nylon, chances are we can sew it, heat seal it, or silkscreen it. We would be more then happy to quote you on any of your projects. Please e-mail us at burchmfg@frontiernet.net, call 515-573-4136, or Fax 515-573-4138. You can also request more information by using our our on-line information request form.